By now it’s pretty common knowledge that PowerShell is Microsoft’s preferred management tool and over the past few years, they have really extended the capabilities of PowerShell to where it can be used for just about every management task. There are even some things that can only be done in PowerShell. Even so, PowerShell is mostly a foreign entity to most SQL Server administrators. The vast majority of SQL Server management is done using T-SQL scripts and SQL Server Enterprise Manager. Microsoft’s recommended way of managing SQL Server with PowerShell is by using the sqlps module. 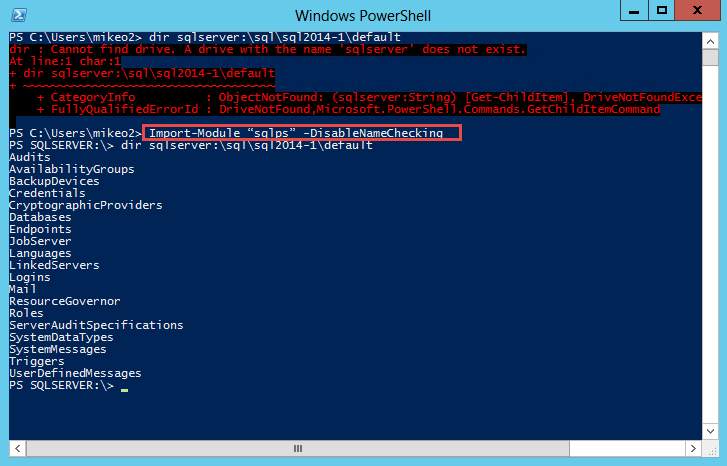 Before using the sqlps module you need to import it into PowerShell using the following Import-Module cmdlet. The DisableNameChecking parameter is used to handle the object naming incompatibilities between SQL Server and PowerShell. Importing sqlps is required when you are working with SQL Server from the standard PowerShell console. As you can see near the top of Figure 1, if you attempt to navigate with the SQL Server PowerShell module before its loaded you will get an error. After importing the SQL Server PowerShell module you can then use the module to navigate and perform other PowerShell commands with the SQL Server instance. 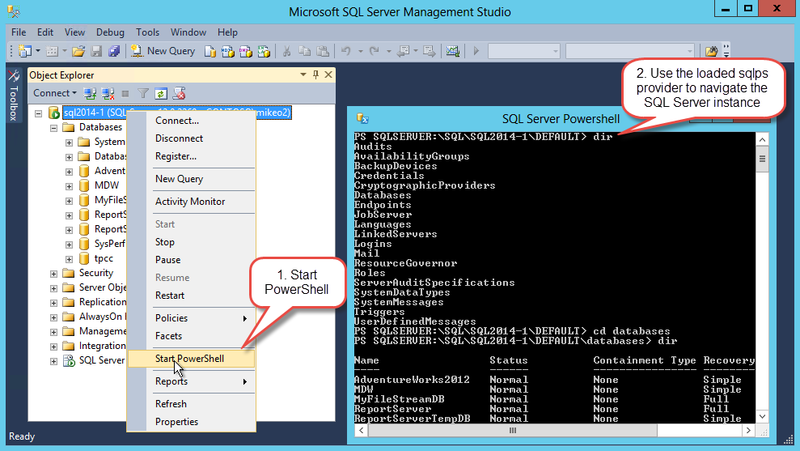 You can also run PowerShell directly from SQL Server Management Studio (SSMS). If you run PowerShell,you can see launching PowerShell from SSMS in Figure 2. When you launch the PowerShell console from SSMS the sqlps module is already installed and ready to be used. Unlike the normal blue PowerShell console, by default when you launch the PowerShell console from SSMS its black. Apart from that there’s little difference and it provides the same sqlps functionality. So far you’ve seen how you can load and use the SQL Server PowerShell provider to navigate a SQL Server instance. You can also use PowerShell to query SQL Server, run commands and more. You can use the SQL Server PowerShell cmdlets for these tasks. There are cmdlet’s to create and manage Availability Groups, Backup, Restore and Policies. One of the most important is the Invoke-Sqlcmd cmdlet which can be used to execute T-SQL and XQuery commands and scripts. You can see an example of using Invoke-Sqlcmd in the following listing. In part 1, I covered the basics of getting started using PowerShell with SQL Server. In part 2,I’ll continue on and dive in to many of the practical examples of performing several common SQL Server management tasks with PowerShell.